RP: Funny, history class always seemed like time retarding to me, too. 6 Responses to RP: Funny, history class always seemed like time retarding to me, too. No, GYM was time-retarding. And anything those other kids did was totally retarded! A time retarder? Like, a time slower? 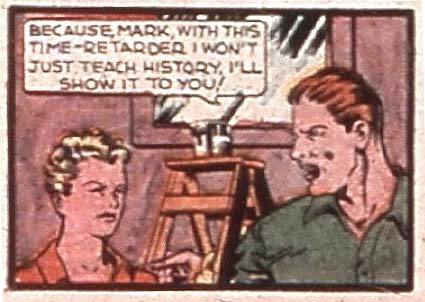 If it’s portable, it would allow you to mimic speedster super-powers, which would be awesome…but wouldn’t really help you teach history, would it? Retard, reverse… what’s the difference? Is it to make his students slower, so he can make wild claims in class like dinosaurs defeated the Nazi’s in 1984 and the moon was discovered be Grover Cleavland?! That’s just stupid, Watson. We all know if was the woolly mammoths who defeated the Nazis in 1984! That’s what’s wrong with the education system today!